Indispensable app for Music Teachers? Slow down music, without changing pitch unless…. Using just the basic version I did feel limited by the restrictions of that version. With the full version I am no longer feeling restricted. Things like being able to get music in to the app is easy. Being able to set up a bunch of hit points per song is easy. Being able to quickly jump back and forth in my loops is easy. I can quickly adjust the start and stop points of my loop point. I can even share all of the marks/hitpoints and settings for all of my songs that I import into AnyTune. The sound quality is wonderful and type of files AnyTune can handle is great. Touch a Mark and the song jumps to that spot in the song. (Marching season just got a lot better! Now we can rehearse any given section of a song as many times as we want. The 16 count drill at Measure 30 need more work? No problem, open AnyTune, tap the Meas. 30 mark, set the loop points and 10 seconds later you are running that drill music for the band to practice marching to! The display of AnyTune is beautifully done. What you see is very appealing. You see a waveform of the song that allows you to visually see what the music doing. Tap the ? icon if you are not sure what an icon is and orange boxes appear and clearly tell you what everything is that you may be confused about. The help screen is nicely done and again is visually appealing! The HQ version of this app has wonderful sound quality. Even when you slow down the music all the way, .10x’s, the music sounds great! The app will go down to .05x but I’m not sure I would describe that as sounding GREAT. I would say that it still sounds good though. Even when you transpose music up or down by semi tones the sound is amazing. I had the music transposed up/down 12 semi tones and it was very much something that a person could use. Of course a Tuba part lowered by 12 semi tones is a bit strange! In my messing around though I had the music transposed more than a 1/2 octave and got distracted by other settings. I actually forgot it was transposed! You can even use the transpose and speed functions at the same time! Loop a section of a song and slow it down to learn it by ear. We should be learning music by ear all the time. Using Marks/Hitpoints on the Marching Band field to practice marching drill to a specific section of your show that needs work. Even if that section is in the middle of the song. With Marks you will be right at the exact spot you want everytime! You can even loop it so the kids can march back and forth without stopping to save time and keep focus heightened. Slow down a recording that is being struggled with and then play along with it. In fact there is a feature that allows you to loop a section 10x’s with each time being gradually faster until you arrive at the original tempo! 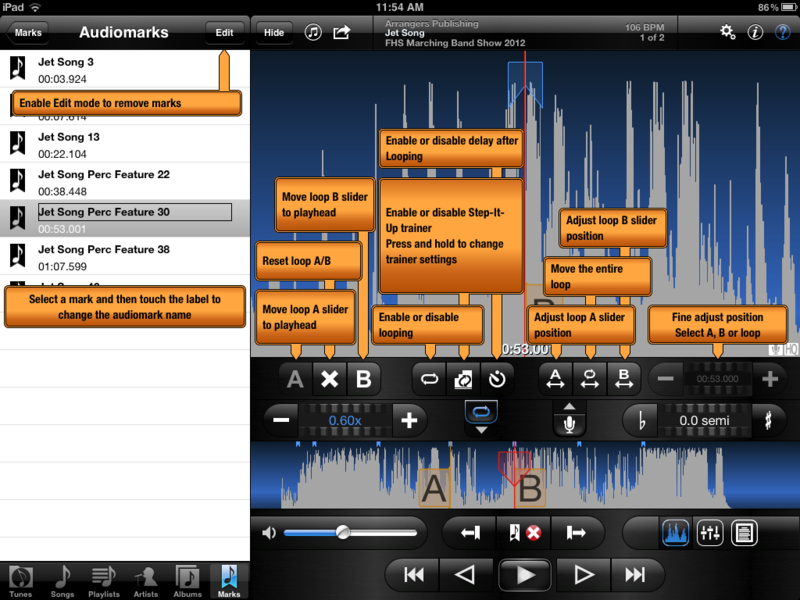 Slow down a recording so that you can hear all the intricate details and give your ears time to pick up on it! Like those fast quad fills and mallet runs. 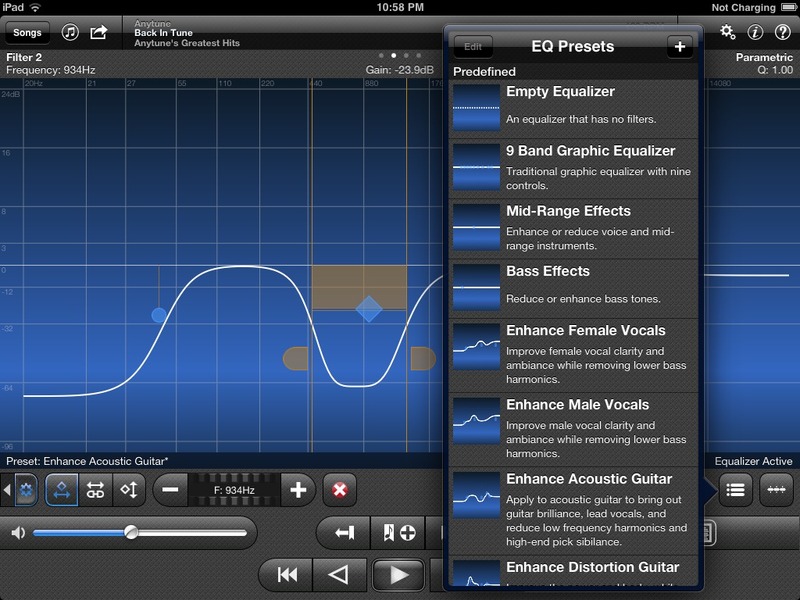 Use the FineTouch EQ to bring out your part more, like a Bass guitar part. Add lyrics into the Lyrics tool so you can sing along with it and not mess up the lyrics! Use this in Choir to rehearse with as it allows you to quickly jump to a specific part in your music. For instance if you only need to rehearse the Bridge of a song then you have no problem immediately jumping to the correct spot in the recording. In the old days you would have had to guess and we know where that gets you when your are in a room of middle school students! Use the app to adjust the key of a song for a particular singer until you find the exact key that works for that student. Sing Karaoke with this app as it allows you to quickly change the pitch of songs, jump between songs and use the LiveMix feature. Now if they would only add some effects to apply to your voice. This could be fun! I will keep you updated on how I use this in class and how well it works when I actually have students in the room! In fact I will be using this tonight at DrumLine rehearsal! I already have my marching band show music loaded and all the rehearsal marks Marked out! There are some nice comparison charts on their website so you can see exactly the difference between the three versions of AnyTune. They also compare AnyTune to another app that has the same idea in mind.